David Kirk’s career spans the top level of both business and sport. He was Chief Executive Officer of Fairfax Holdings Limited, Australia’s largest publishing group, from 2005 to 2008. His current positions include Chairman of the Hoyts Theatre Group and a Director of Forsyth Barr, one of the largest investment banks in New Zealand. 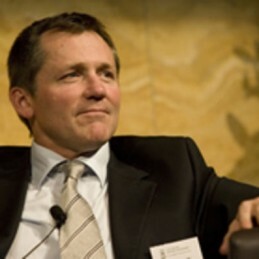 David Kirk represented New Zealand in rugby union from 1983-1987. He played for the Otago and Auckland provinces and captained the All Blacks in 1986 and 1987. In 1987, under his leadership the All Blacks won the inaugural Rugby World Cup. In 1987 he was awarded an MBE for services to rugby. In 1987 he took up a Rhodes Scholarship at Oxford University, studying Philosophy, Politics and Economics. His first degree was in Medicine. He graduated from the University of Otago in New Zealand in 1985. Upon returning from Oxford, he worked for three years as first Executive Assistant and then Chief Policy Advisor to the Rt. Hon. Jim Bolger, Prime Minister of New Zealand. He moved onto Fletcher Challenge Paper and Fletcher Challenge Energy in senior executive roles in New Zealand and Australia, and then became Regional President, Australasia for Norske Skog the world’s second largest manufacturer of newsprint and magazine grades of paper. In a major recognition of his talents, David was elevated to CEO and Managing Director of PMP Limited, the largest magazine and commercial printing and media services company in Australia. The company was publicly listed and had revenue of approximately A$1.4 billion and 4,000 employees. From October 2005 to December 2008 he was Chief Executive Officer of Fairfax Media—publisher of The Sydney Morning Herald, The Age and The Australian Financial Review in Australia; and The Dominion Post and The Christchurch Press in New Zealand. On occasions he was also a journalist for Fairfax – commentating on rugby when regular journalists are on strike. On 24 October 2011, Kirk was inducted into the IRB Hall of Fame alongside all other Rugby World Cup-winning captains and head coaches from the tournament’s inception in 1987 through to 2007. David is President of the New Zealand Rugby Players Association, an honorary ambassador for the World Food Program and is a Trustee of a number of charities. He is also the author of two books Black and Blue and The Road to Cardiff (with Graham Hutchins) and has been a regular contributor to newspapers around the world. Co-founder and current Managing Partner of Bailador Investment Management. Chairman of the Board at The Hoyts Group, a position he has held since July 2009. Chairman of the Board at Trade Me Group. Chairman of Standard Media Index Ltd (investee of Bailador).